We develop applications based on plastic and composite materials with capacity to obtain prototypes and functional demonstrators for tests, demonstrations, assessment of functionality and even first pieces. To do this we have transformation processes at pilot and industrial plant-scale. Among these applications are the sandwich panels that form plastic skins with different core materials, in addition to the development of phase-change materials for the isolation and improvement of thermal efficiency. We also develop multilayer laminates and textile composites for applications in transport, the automotive sector, textile architecture, sports, packing and packaging, etc., and are experts in the analysis and detection of faults in composite transformation processes (SMC, RTM, infusion). We obtain test tubes and demonstrators for testing. We develop applications in co-injection. We assess the injectability of thermoplastic formulations. We undertake the production scale-up of additivated pellets for obtaining injection and extrusion test batches. We develop thermoplastic compound micropellets. We obtain thermoplastic laminates and films by means of extrusion/calendering. We develop thermoplastic compounds for 3D printing by fused deposition modelling. We develop rotational moulding applications for rigid and flexible pieces, with thermoplastic resin powder and micro-pellets and with plastisols and vinyl powder. 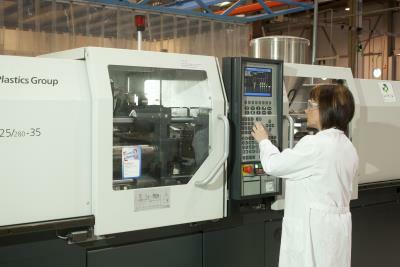 We develop rotational moulding for rigid and flexible pieces with thermoset resins. We develop plastic laminate for thermoshaping. We undertake mouldability tests for the thermoshaping of plastic laminates. We obtain prototypes of thermoshaped pieces and shaped laminates for decoration by over-injection or compression in moulds. We develop pieces by injecting resin onto fibre preforms in closed moulds. We develop composite RTM moulds and obtain first pieces. We simulate the resin injection process to achieve optimal filling, define injection points and design moulds. We develop pieces by means of vacuum resin infusion on fibre preforms. We study the best combination of resin and fibre types for an application. We develop composite infusion moulds and obtain first pieces. We develop customised prepegs with specific formulations and combined fibre types for their transformation by compression or vacuum. Vinylester prepegs with glass or carbon fibre with mechanical properties similar to epoxy. Phenolic SMC with good fire behaviour. We have three presses with different tonnage for transforming prepegs, laminates and composites by compression. We produce multilayer film and thermoplastic sheets in presses. We develop hollow pieces by winding filaments over a mandrel: pipes, elbows, tanks. We manufacture pultrusion profiles by combining different types of resins and reinforcements, including thermoplastic resins. We mould prepegs in vacuum bags. We apply microwave technology to the curing of resins and thermoset composites related to lamination, RTM, infusion, filament winding and pultrusion processes. We additivate thermoplastic and thermoset polymer formulations with loads, reinforcements and microwave susceptor additives and volumetrically heat or cure in the moulding stages. We develop multilayer materials, combining plastic materials. We develop hybrid multifunctional materials combining different kinds of layers (plastic-metal-wood-paper-reinforcements, foams, etc.). We develop sandwich materials combining different kinds of plastic skins and foam cores. We develop laminated thermoplastic composites reinforced with fabric, mats or unidirectional reinforcements. We reinforce with glass or carbon, aramid, natural and metallic fibres. We have a pilot plant for decorating (gravure, reverse gravure, flexo, etc. ), coating and laminating all kinds of plastic, metallic, textile or paper films supplied in spool form. CAD/CAE calculation and design of plastic and composite pieces using finite elements to determine the appropriate geometry and thickness for a specific application. 3D printing: obtaining of prototype pieces by means of ABS filament deposition. Development of prototypes and pilot runs of pieces at our pilot processing plants including the development of moulds and plastic prototype parts, by means of casting and moulding techniques with thermoset resins and composites.